Loader for a wrench (force+torque) at a specific position of a beam. An atomic load on the beam is a wrench, i.e. force+load applied at a certain abscissa U, that is a six-dimensional load. 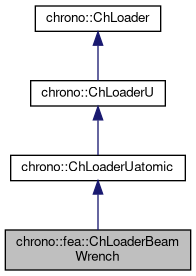 It is not a distributed load, so inherit it from ChLoaderUatomic. Set the position, on the surface where the atomic load is applied.